After seeing the Clinique Pop Lip Colours being featuring on a variety of blogs and Instagrams, I went straight out, swatched them and snapped a few up. Described as having a luxurious, yet weightless formula which merges bold colour with a smoothing primer I know that it was going to be right up my street. 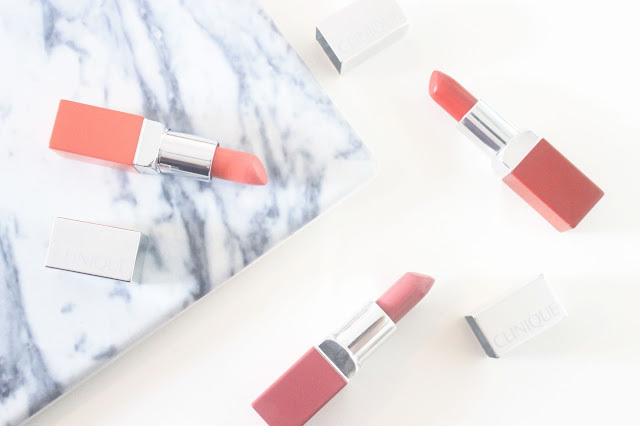 Usually I don't expect much from hydrating lipstick formulas as I find that their staying power and pigmentation is poor, however to my surprise these have the perfect combination of colour, comfort on the lips and hydration. All 16 shades in the range have a demi-matte formula with colours that pack some serious punch. I picked up three shades a couple of weeks ago and have been smitten ever since. Melon Pop is a wearable coral shade that looks perfect with a tan or when you want to throw on a lipstick and get going. Plum Pop is a muted pink/purple hybrid, if you like MAC's Twig then you'll definitely like this. Opaque after one application, I keep reaching for this whenever I'm in doubt of what lipstick to wear. Last, but certainly not least it's Passion Pop, my go-to lip shade for the warmer evenings. Unlike other red lipsticks, I find this hydrating, long wearing and comfortable to wear, even though it has great colour pay off, I never feel like it's too OTT. From the first glance, the packaging got a 10 out of 10 from me, the coordinating exterior to the shades inside means that I can differentiate between lipstick colours instantly. Normally I'm not a glossy lip kind of girl, but the lightweight formula nourishes and conditions my lips throughout the day. For £16, the quality is exceptional and I will no doubt be stocking up on more shades throughout the coming months. 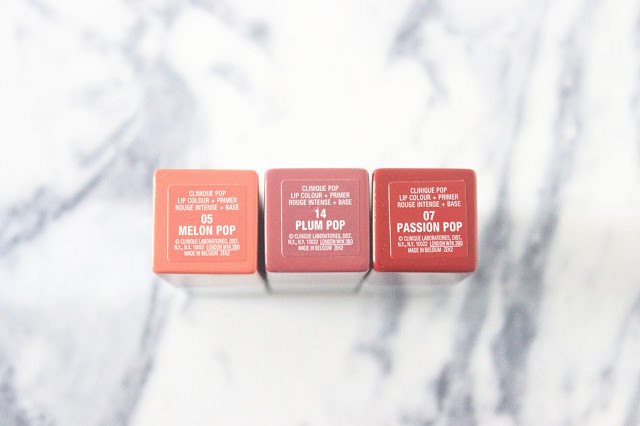 Have you tried any Clinique Pop Lip Colours?